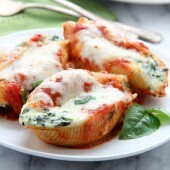 Cheesy ricotta and spinach stuffed shells are an easy and flavorful dinner for any night of the week. Cook 12-16 jumbo pasta shells according to package directions. Meanwhile, microwave frozen spinach for 2-3 minutes. Break up with a fork and cook for an additional minute if necessary to heat through. Place spinach into the center of a sheet of cheese cloth. Rest wrapped spinach in a wire strainer set over a medium bowl. Allow spinach to cool before squeezing out liquid. In a medium bowl, combine ricotta, Parmesan, salt, pepper and egg. Combine well. Mix in drained spinach. Chill in the refrigerator until ready to use. Drain pasta. Add roughly 1 1/2 cups tomato sauce to the bottom of a 2 quart rectangular baking dish. Divide ricotta mixture among 12 shells. Top off with additional sauce and sprinkle with mozzarella cheese. Bake for 30 minutes or until cheese is fully melted and shells are heated through. Garnish with chopped fresh basil. Serve warm. *For easier stuffing, add ricotta mixture to a large plastic bag or piping bag with corner snipped off. Squeeze filling into shells.